SEOPress Pro theme is fully compatible with Visual Composer Page Builder, Massive Addons for Visual Composer, Revolution Slider and Uber Mega Menu. It includes all types of page templates such as Default Sidebar, Full Width, Full With for Page Builder, Landing Page (Full Width, No Header and Footer). So you can use this theme for any type of website. Additional Focus: Responsive and easy page builder, Mega menu options and slider. 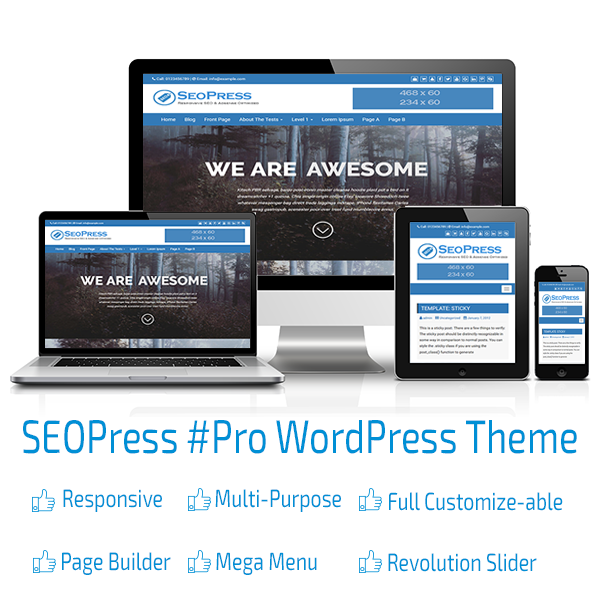 Get SEOPress Pro WordPress theme today. you will be more than happy! Header Layout, Sticky menu, Back to top button options, Custom page loading icon options including one click Enable/Disable, Custom Background, Custom Colors, Custom Header, Custom Menu, Editor Style, Featured Images, Post Formats, Sticky Post, Threaded Comments. Just want to thank you for your awesome SEOPress Pro theme. it is super easy to use and thank you for your quick support all time. Really great WordPress theme… so easy to use and intuitive yet it delivers a sophisticated, cutting edge site!! Very, very pleased with this. Been using it for almost a year, very fast and very simple to use.